On a whim, I wikied "star trek novels" and got an entry that printed out at 40 pages. Up through the early '80s most of the titles were familiar, and many had been read; after that it was pretty much terra incognita; a final frontier where this man (at any rate) had not gone before. As my myriad fans here on GR know, I've been going through one of my periodic Trek phases for going on several months now and have been sampling the newer novels that sound interesting. Glass Empires is an omnibus collection of three novels set in the Mirror Universe of the TOS episode "Mirror, Mirror," where Kirk et al. find themselves in an alternate universe where the Federation is a tyrannical Empire and their counterparts are little better than bloody-handed pirates. 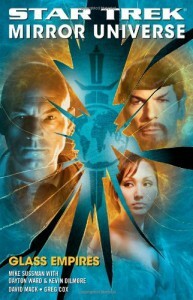 The first novel takes place during the "Star Trek: Enterprise" era, Mack's novel recounts the Mirror Spock's efforts to take over the Empire, and the final novel takes place during the "Next Generation" era, after the collapse of the Empire. Age of the Empress - 2 stars: This novel picks up right after the events at the end of the "Star Trek: Enterprise" Mirror Universe two-parter episode. Hoshi Sato murders Captain Archer and seizes control of Defiant, a Federation Starship from our universe that disappeared in the TOS episode "The Tholian Web." Using Defiant's superior technology, she proclaims herself Empress and the rest of the book recounts her efforts to secure that position. It's...serviceable. Not a bad read but not very memorable. And if you haven't seen at least the "Enterprise" episodes referred to above, you'll be completely lost. The Sorrows of Empire - 3 stars: This is the best of the three and you can see my review here: http://www.goodreads.com/book/show/6434811-the-sorrows-of-empire as I read it in a standalone edition. * Within the space of five pages, a planet goes from being Calder II to Camus II and then back to being Calder II. * A disruptor suddenly becomes a phaser. For a Trekkie, there's a clear distinction (trust me). * There's a scene where a character warns against using disruptors because it will alert the bad guys to their presence but then a page later uses a disruptor. * "The jarring impact bulldozed the breath from her lungs." This is typical of the writing quality throughout but for some reason this sentence in particular offended me. * Mirror Picard tractor beams an Iconian probe (which is 600 meters across) and drags it off to the final battle with the Borg using a beat-up Danube-class runabout. For the non-Trekkie, you'll have to trust me that this is absurd even for "Star Trek." * Mirror Picard "just happens" to have equipped his runabout with the Bajoran solar sails seen in an episode of "Deep Space 9" so when he has to jettison his warp core and nacelles, he still can make it to the climactic battle. * After the final battle, Mirror Picard salvages another warp core from a destroyed ship and warps away - BUT HE STILL DIDN'T HAVE ANY NACELLES!!! Gahhhh!!!! For the Star Trek fan, I'd recommend Mack's book and give a qualified thumb's up to Ward and Dilmore's effort (if you've got absolutely nothing else to read) but avoid Cox's dreck. *Two reasons for that, primarily: (1) The writing quality was too often subpar for me to waste time and/or money on the books, and the good authors - like McIntyre, Ford, Hambly - went on to establish themselves outside of the niche. (2) After Kirk/Spock/McCoy, there just really wasn't anyone else I was interested in character-wise, and Paramount took the series in a very dissatisfying direction (ugh).